Bangkok (Thailand) – October 25, 2018 (travelindex) – The Tourism Authority of Thailand (TAT) is strengthening its organization by paying attention 360-degree style, which allows employees and staff to introduce new ideas. This approach will help to foster good governance among to state-owned enterprises. 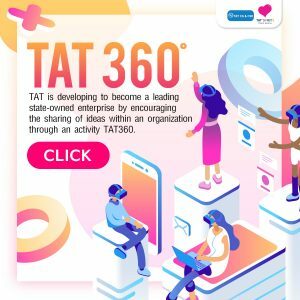 The TAT 360 activity invites TAT staff and personnel to share new ideas in Corporate Governance (CG), Corporate Social Responsibility (CSR) and Innovation through its Facebook Fanpage: TAT CG & CSR. The best of these ideas will be selected to add to the development of the organization in various fields and to enhance Thailand’s tourism marketing communications in the future. The TAT expects that promoting greater staff participation will improve communication between the various sections of the organization, and thus help it to become a leading state enterprise. In the future, the TAT plans to introduce more activities aimed at both developing the organization in various areas and also promoting domestic tourism. See more details at www.tourismthailand.org/tatcgcsr or Facebook Fanpage: TAT CG & CSR.